We are defining butterfly color using digital imagery from Encyclopedia of Life, Butterflies of America, and the Florida Museum of Natural History. We use an automated process in python & OpenCV to extract the butterfly from an image and characterize the color content of butterfly pixels. We can then characterize color for individuals and species. Currently this approach is being applied to adult butterflies only. 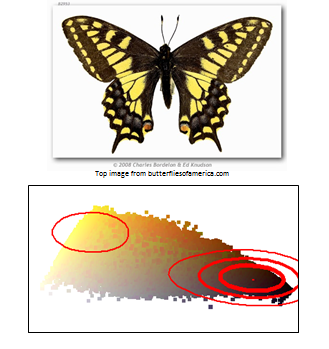 The contour plot on the right shows the principal components of color from the Papilio machaon specimen shown above. The red ellipses indicate the colors with the highest density of pixels. Our color characterization may be applied to images with or without color calibration. Some collections of images among those we are analyzing allow for color calibration, which will be used to test its impact on color data.